The 20-year-old student at All Saints University in Belair, who was supposed to have been sentenced last Friday, pleaded guilty to falsely representing himself to immigration officer Shawn Bradshaw, to be the son of Janet Jackson of Belair. He also pleaded guilty in relation to a charge of presenting a Form A passport application and birth certificate in the name of Janet Jackson, pretending that Jackson was his mother. The young man said he was promised to be taken care of when he arrived in St Vincent in February 2012 on a scholarship, but added that he has been providing for himself financially. 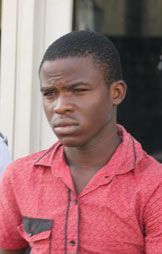 SEARCHLIGHT has learnt that Ugwu attended the same church as the woman he defrauded, who had taken him to live with her. Senior Magistrate Donald Browne said the court is willing to be lenient on Ugwu, but it noted that it is a âvery serious offenceâ. âThis is a very serious offence thatâs causing the nation of St Vincent and the Grenadines a lot of trouble … Because of the problems like what he has raised, we now canât go to Canada unless we have a visa,â Browne said. âHeâs come here and look at the stupidness he has done. As much as I want to assist him, my hands are also tied,â the magistrate further stated. Browne noted that one of the charges carries a maximum of three years in prison and the other, one year. âHeâs pleaded guilty and has shown his remorse, but that doesnât assist the court to the extent that the court can say, âGo away and behave yourself.â The court canât do that,â Browne added. The magistrate said the only option open to the court is to have him serve a short sentence and then have him deported. Another Nigerian, who is also a student at the university, spoke again in court on Ugwuâs behalf. He told the court that several attempts from different people were made to help raise funds for Ugwuâs school fees. He further added that the university was demanding the complete fee. âI told him to be patient and he kept telling me that he is scared and also that someone wanted to adopt him,â the man told the court. Before sentencing can take place, Browne said he wanted a representative from the school to come to court today to discuss Ugwuâs situation. The investigating officer informed the court that Janet Jackson is currently overseas.